Always respond on time through predictive and proactive monitoring. Guarantee the end-to-end availability and performance of your IT services and business services through chain monitoring and management. The Gensys Monitor can be deployed for virtually any system, platform or application, in the cloud or on-premises. Monitor multiple (internal) client environments, whether distributed or not, from one system. Particularly suitable for Managed Service Providers and Shared Service Centres. Predict IT behaviour. Prevent disruptions. Make management plannable. See the disruption of digital processes immediately. Drill down to the causes in the IT chain. Insight into the application performance including that of the IT on which the application depends. SLA-driven event management. Efficiency through intelligence. For all platforms. Asset, availability, performance and usage monitoring of Azure and the Azure Stack. Availability, performance, capacity, usage, user experience. Gensys monitors everything. Predict the behaviour of your IT components with the smart Gensys IT Monitor. Intelligent technologies process and analyse the huge volume of data from IT components. Gensys gives you insight into the future behaviour of your IT and avoids disruptions or degradations. Ensure the uninterrupted operation of the business processes. See at a glance any (threatened) disruptions which process will be affected. This is also possible per geographic location. Monitor digital processes and analyse problems in the underlying IT quickly and effectively. Easily monitor the availability and performance of all business applications. From fat-client and VDI applications, terminal services applications like Citrix to browser-based applications. Gensys ensures that only relevant notifications are shown. Don’t reinvent the wheel, thanks to the Gensys knowledge base. The SLA determines how notifications are offered and must be handled. If not responded to in time, escalation takes place. Relevant events are not lost. The Gensys Monitor is suitable for virtually all systems, platforms and applications. 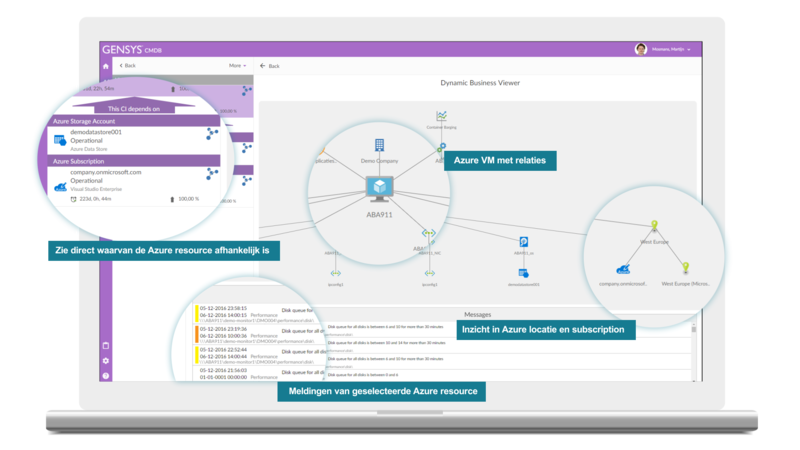 Monitor your (hybrid) Azure cloud solution as though it were a regular on-premises environment. 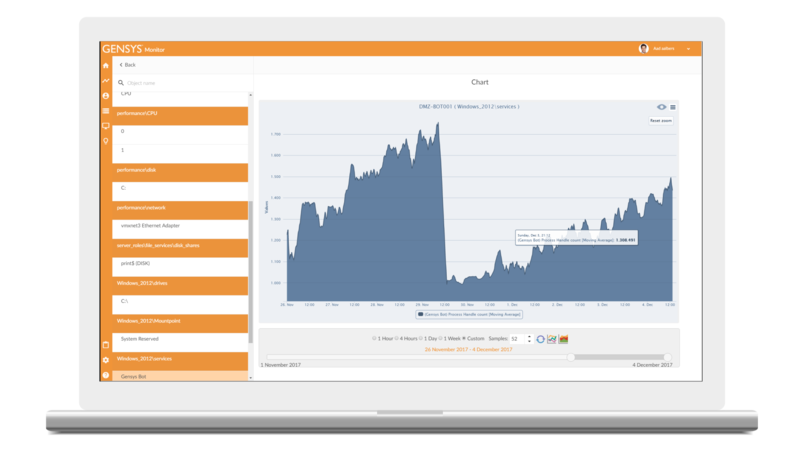 Analyse detailed asset, availability, performance and usage details. Run reports on the performance and monitor the costs. Ensure that you never pay too much. Including for Azure Stack. Monitor the availability of every IT component and keep an eye on the availability of IT and business services, because the Active CMDB knows the dependencies. Respond in time because of thresholds and automatic escalation. Create performance analyses and forecasts at any time. Prevent problems with the ‘predictive management’ of Gensys. Monitor the use and usage of IT components (CI) and receive notifications depending on established threshold values for the CI. Measured values are saved, and create analyses and reliable capacity plans. Be assured of adequate cost management through alerts, historic data analysis and projections based on this. 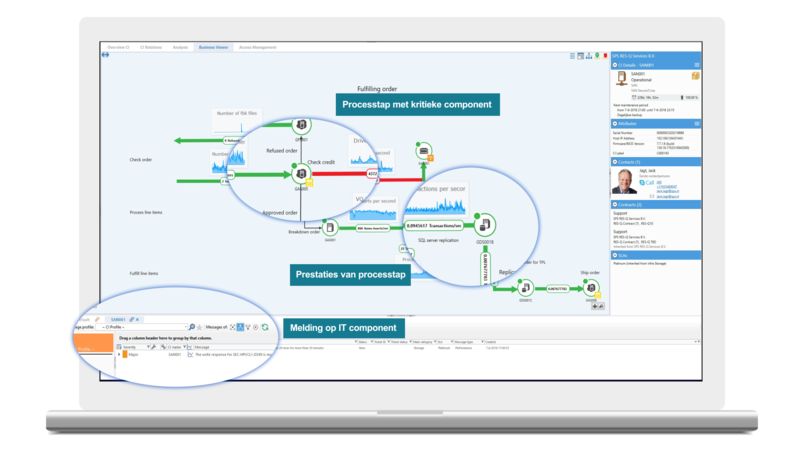 Gain complete insight into the behaviour of applications, from the user’s point of view, through monitoring the performance and availability of an IT chain. 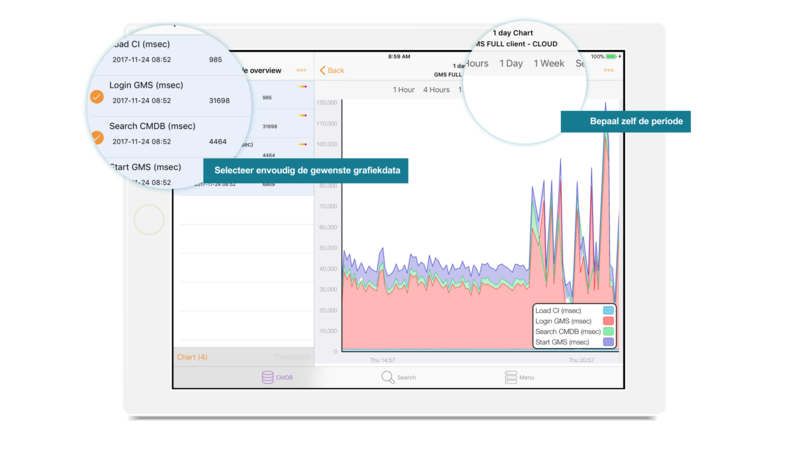 Have insight into the entire current infrastructure, including the dependencies, with Gensys and the Gensys EUX monitor for APM. See detailed performance data and easily create performance analyses of the end-to-end chain. Learn what it means to really be in total control. Read the brochure. Want to see Gensys with your own eyes? Like to see how Gensys works with your own eyes? A demo can be set up in one minute!